This site is dedicated to the longevity and success of Hank Williams Jr.'s career! This site is also dedicated to the fans of the man. You all know who you are, so I'll just pass on listing any names. Hank Jr. has the best fans in the world, I should know cause I'm one of 'em ;) If ya don't believe me just stop over at the 'official' Hank Jr. message board and read some of the fans' posts. You'll see what I mean! You can find the url on my related link's page. Throughout this web-site I've included some basic information on Hank Williams Jr., his discography & videography, show reviews (send 'em on in), my concert photos, the Mailbag page, links to my favorite sites, the contact page, and the 'new' Sounds page. Thanks for taking a look at my site. Be sure to sign my GuestBook below or send me a private e-mail with your thoughts and suggestions. I'll be updating frequently (I hope), so please check back often. 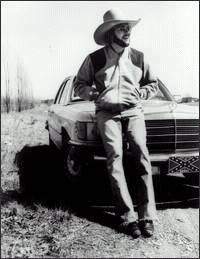 This here picture shows Hank Jr. from what I believe was the late 70's. In my opinion, Hank Williams Jr. is the best all-around musician, ever! Bold statement!!! Here's why I feel that way. Hank is capable of writing and performing just about any form of music: country, rock, cajun, jazz, blues, etc. His music runs the gamut of emotions and topics: revenge, love, sad heart-break songs, party tunes, political issues, and the list goes on and on. Another impressive aspect of Bocephus is his longevity in the music business. At the age of 8 he was publicly performing the songs of his father and by the age of 15 he had started his own recording career. Some 36 years later and he is still going strong. Few other artists can boost the sucess and accomplishments of Hank Williams, Jr.